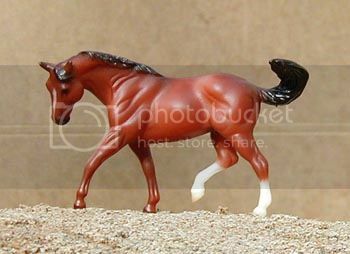 Also please note there is a unicorn mold on this page, but he is pedigreed as a plain old Quarter Horse. 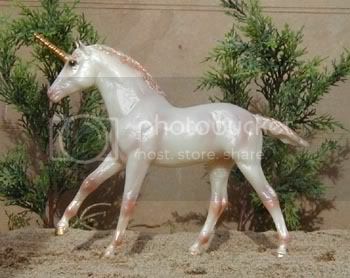 I treat unicorn/pegasus molds the same way I treat fantasy colored models and pedigree them simply as real horses. 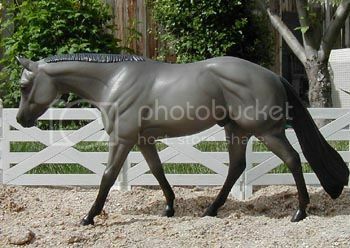 If it bothers you, I have plenty of other models to choose from for parents of your horse. Lines to Zip's Chocolate Chip, Zippo Pine Bar, Skipper W., Northern Dancer[TB], War Admiral[TB], Man O War[TB]. 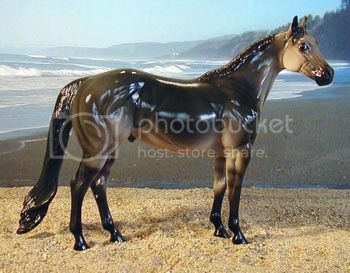 Model information: Hartland/Sheryl Leisure OF "Walter/Change of Hart" resin; portrait of the real "Walter:" A Horse of Course. Lines to Rowdy Blue Man, Blue Valentine, Red Man, Joe Hancock, Buckpasser[TB]. War Admiral[TB], Man O War[TB]. 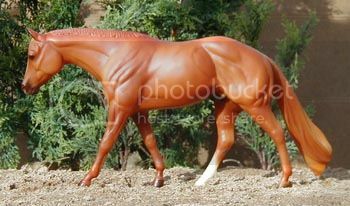 Model information: Breyer Traditional scale "Smarty Jones" mold; "Rushmore" special run for Breyerfest 2007; 1,250 made. Lines to Zan Parr Bar, Two Eyed Jack, Three Bars[TB], Go Man Go, The Invester, Zippo Pat Bars, Poco Bueno. 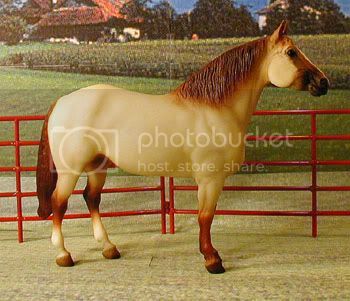 Model information: Breyer Traditional scale Stock Horse Stallion mold; "Skipster's Chief," Famous Therapeutic Riding Horse, produced 1991-1992. 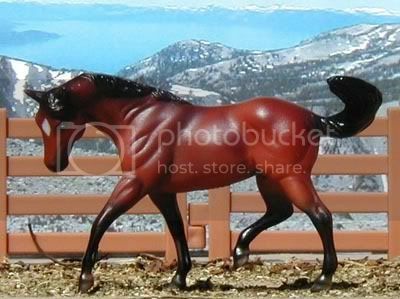 Homozygous for black: will only ever produce a black or bay based foal depending on the dam he is bred to. Lines to Rowdy Blue Man, Blue Valentine, Joe Hancock, Zippo Pine Bar. 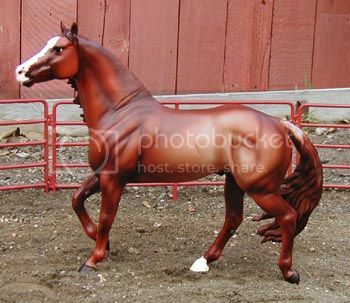 Model information: Traditional Stone Ideal Stock Horse "Cowboy Joe" special run. Lines to Zips Chocolate Chip, Zippo Pine Bar, Smart Chic Olena, Smart Little Lena, Doc O Lena, Doc Bar, Peppy San, Three Bars[TB], Poco Tivio, Poco Bueno, Skipper W., Impressive, Poco Lena, Bold Ruler[TB]. 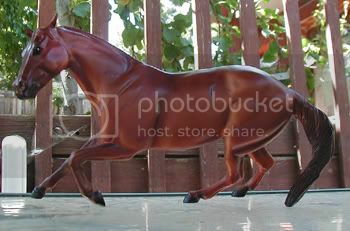 Model information: Breyer Stablemate scale G2 Stock Horse mold; #5904 Dark Chestnut Quarter Horse, produced 2003-2006. Lines to Continental King, King, Impressive, Leo, Poco Bueno, Joe Reed, Joe Hancock, Hollywood Gold, Doc Bar. 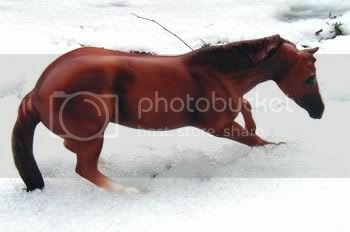 Model information: Traditional scale Stone Ideal Stock Horse "Seven," regular run in 2000. Lines to Mr San Peppy, Wimpy, Poco Bueno, Diamonds Sparkle, King, Rugged Lark, Two Eyed Jack, Go Man Go, and Bold Ruler[TB]. 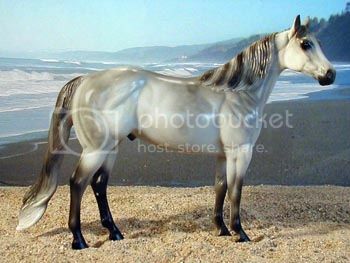 Model information: Traditional scale "Okie Rio" artist resin sculpted by Carol Williams and painted by an unknown artist with the initials "MFB." If you know who this is, please email me at crazycatmaddie@gmail.com. Thanks! Lines to Smart Chic Olena, Two Eyed Jack, Doc Bar, Easy Jet. 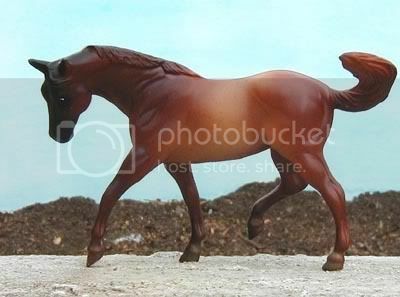 Model information: Breyer SM G2 Stock Horse from the Flicka in the Wildset, sold through Wal-Mart in 2006. Lines to Go Concord, Wonder Cause, Exceller[TB]. 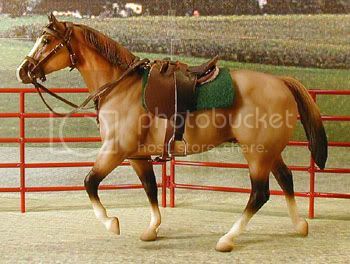 Model information: Breyer Classic scale "Scamper" mold, #6003 Barrel Racer with Barrel from 2000-2001; also in #6013 Barrel Racing Set, produced 2001-current. Lines to Impressive, Two Eyed Jack, Mr. Conclusion, Rugged Lark, Zippo Pine Bar, Poco Bueno. 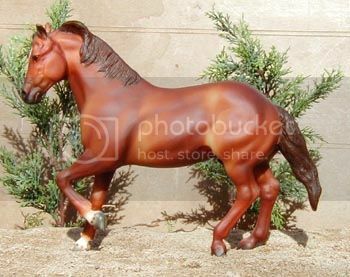 Model information: Traditional scale Stone Ideal Stock Horse "Mountain GEM" (glossy version) special run in 2000. Lines to Rowdy Blue Man, Blue Valentine, Red Man, Joe Hancock, War Admiral[TB], Man O War[TB], Zippo Pine Bar, Poco Bueno, Doc Bar. 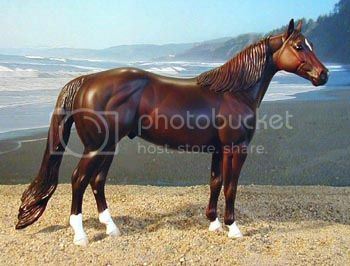 Model information: Breyer Traditional scale "San Domingo" mold; Toys R Us special run in 2000, "TRU Riley;" 7,500 produced. Lines to Mr San Peppy, Wimpy, Poco Bueno, Diamonds Sparkle, King, Two Eyed Jack, Doc Bar. 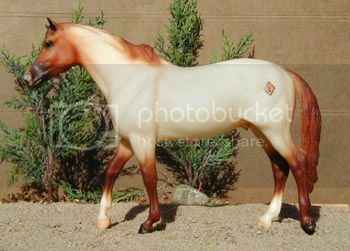 Model information: Traditional scale Stone Ideal Stock Horse custom by Amarna. Lines to Zippo Pine Bar, Two Eyed Jack, Doc Bar, Joe Reed, Impressive, Docs Benito Bar, Sonny Dee Bar, Three Bars[TB], Leo, Doc Bar, Poco Tivio, Poco Bueno. 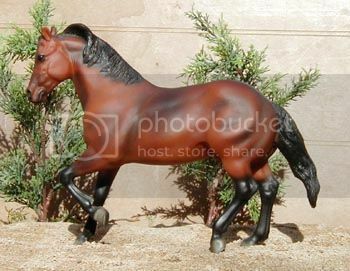 Model information: Traditional Stone Ideal Stock Horse "Breeze" special run from Tractor Supply stores. 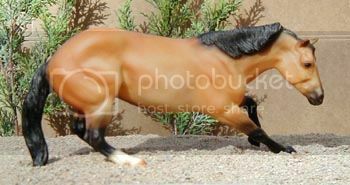 Long mane, long tail, stallion version. Lines to Zippo Pat King Bar, Easy Jet, Docs Benito Bar. Model information: Breyer "Zippo Pine Bar" mold; custom painted by Janet Davis. Lines to Dash For Cash, Sonny Dee Bar, Doc Bar. 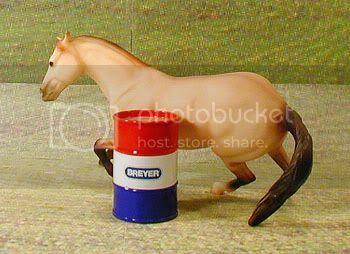 Model information: Breyer Stablemate G2 Stock Horse mold; Breyerfest Stablemates Keychain set<, 2000 Breyerfest Special Run, 1,500 sets made. 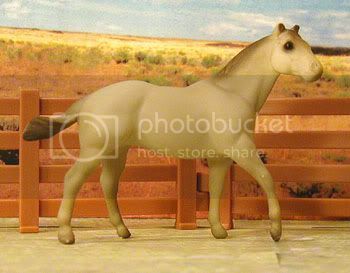 Lines to Zippo Pine Bar, Smart Chic Olena, Skipper W.
Model information: Breyer SM G2 Stock Horse from the Flicka Stablemates set, produced 2006-current. Lines to Rugged Lark, Flying X 6, Hollywood Gold, Joe Hancock, Zippo Pine Bar. 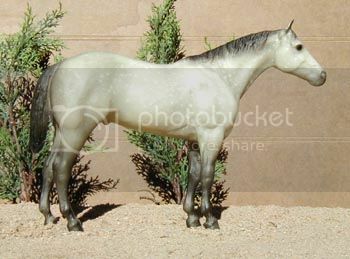 Model information: Breyer Traditional scale "Stud Spider" mold; AQHA/Quarter Horse Outfitters special run in 1998; 2,500 made; portrait of the "Gray Badger II." Lines to Genuine Doc, Doc Bar, Diamonds Sparkle, King, Wimpy, Three Bars[TB]. 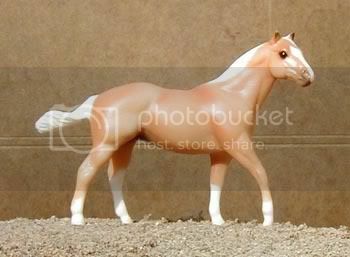 Model information: Breyer Traditional scale "Adios" mold, "Rough N Ready" Quarter Horse;" produced 1993-1995. Lines to Zippo Pine Bar, Two Eyed Jack, Go Man Go, Sonny Dee Bar, Three Bars[TB], Leo, King. 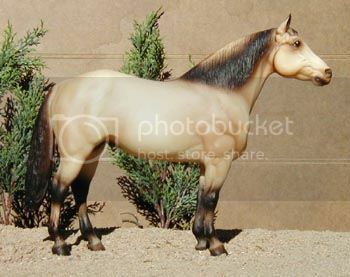 Model information: Stone Chips scale Stock Horse mold, Palomino Stock Horse Chip; produced in 2005. Lines to Hollywood Dun It, Sugar Bars, Three Bars[TB], Deacon Jack, Two Eyed Jack, King, Yellow Jacket. 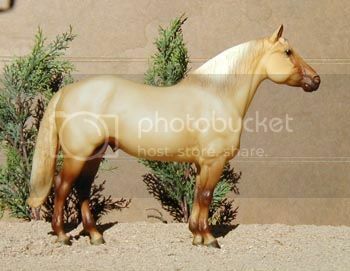 Model information: Traditional scale Breyer Adios mold, portrait of the real "Hollywood Gold;" special run for AQHA/Quarter Horse Outfitters in 2000. Lines to Hancocks Blue Boy, Blue Valentine, Red Man, Joe Hancock, Zippo Pine Bar, Two Eyed Jack, Miss Rebel Rita, Top Deck[TB], Man O War[TB], Poco Bueno, Leo. 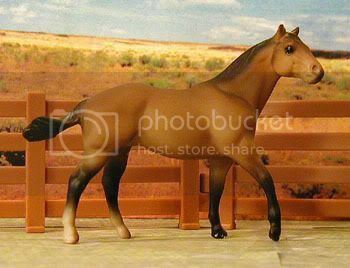 Model information: Breyer Stablemate scale G1 Quarter Horse Stallion from the Stablemates Barn set; JCPenney holiday catalog special run in 1998. Lines to Zippo Pine Bar. 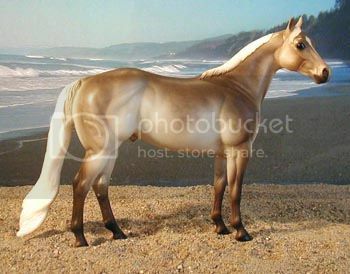 Model information: Breyer Action Stock Horse Foal mold; Orion and Zorian set; special run for the 2002 JCPenney holiday catalog. Lines to Mr Yella Fella, Page Impressive, Impressive, Hollywood Gold, Roan Hancock, Buckpasser[TB], War Admiral[TB], New Providence[TB], Bull Page[TB]. 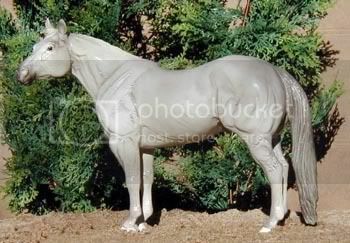 Model information: Stone Horses Traditional scale Ideal Stock Horse mold; portrait of "Whiz By Hollywood," produced 2001. Lines to Wonder Cause, Easy Jet, Good Asset, Zippo Pine Bar, Poco Bueno, Pacific Bailey, Grey Badger II, Hollywood Gold. 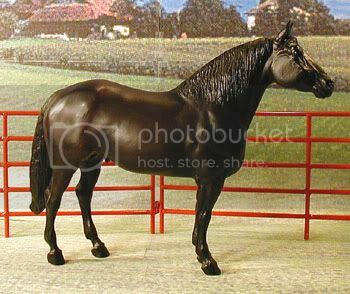 Model information: Breyer Stablemate scale G1 Quarter Horse Stallion, from the 12-Piece Stablemates set, special run for the JCPenney holiday catalog in 1996. Lines to Juno Dat Cash, Dash For Cash, Three Bars[TB], Go Man Go, Whirlaway[TB], Jet Deck, Bold Ruler[TB], Skipper W, Joe Hancock. 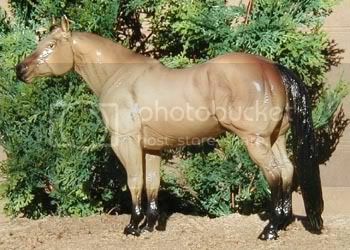 Model information: Traditional scale Stone Ideal Stock Horse mold, "Jake;" special run for State Line Tack in 2001. Lines to Smart Chic Olena, Two Eyed Jack, Skipper W, Doc Bar, Easy Jet. 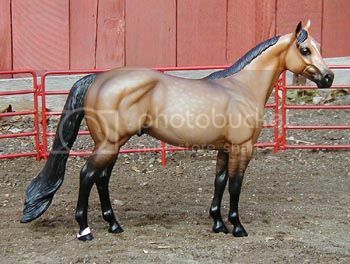 Model information: Breyer Traditional scale portrait of the real "Smart Chic Olena," produced 2005-current. Lines to Zippo Pine Bar, Two Eyed Jack, Go Man Go, Doc's Benito Bar, Doc Bar, Scotch Bar Time, Sonny Dee Bar. 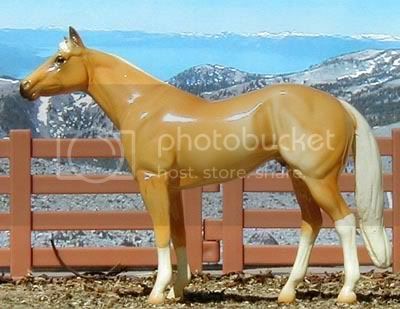 Model information: 11 inch series Hartland Quarter Horse, 1992 raffle model of 26 pieces for The West Coast Model Horse Collector's Jamboree. Lines to Mr. Gun Smoke, Cee Bee Command, King, Poco Bueno, Leo, Joe Reed. 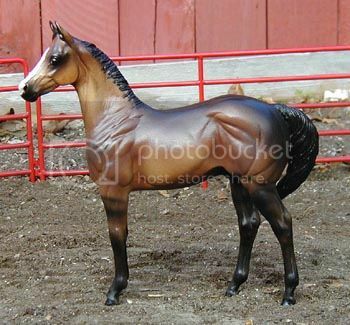 Model information: Breyer Standing Stock Horse Foal mold; Watchful Mare and Foal set, special run sold through Toys R Us in 1993. Lines to Dash For Cash, Sonny Dee Bar, Premium Skip, Skipper W, Hollywood Smoke, Mr Gun Smoke, Wimpy. 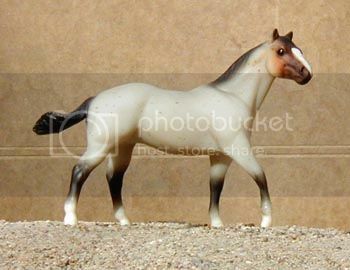 Model information: Breyer Traditional scale "San Domingo" mold, Comanche Pony; produced 1990-1992. Lines to Smart Chic Olena, Peppy San, Leo, Joe Reed, Three Bars[TB], Two Eyed Jack, Kings Pistol, King. 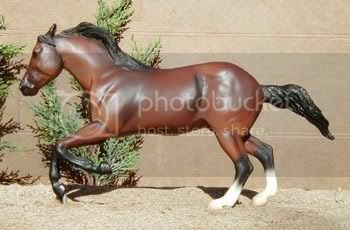 Model information: Traditional scale Stone Ideal Stock Horse "Streak MackTavish," produced in 2002. 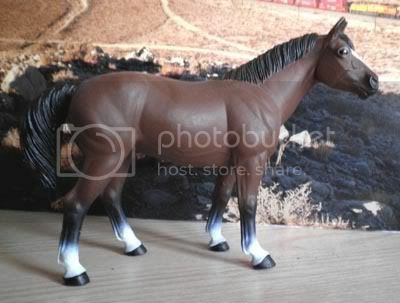 Lines to Zippos Back In Black, Zippo Pat King Bar, Zippo Pat Bars, Three Bars[TB], Impressive, Easy Jet, Skipper W.
Model information: Breyer Stock Horse Stallion mold, #992 "Doc's Keepin' Time," Quarter Horse, produced 1997-1999; version with "bi-color" eyes from early 1997 only. Lines to Hollywood Dun It, Zippo Pine Bar, Poco Tivio, Poco Bueno, Son O Sugar, Sugar Bars. 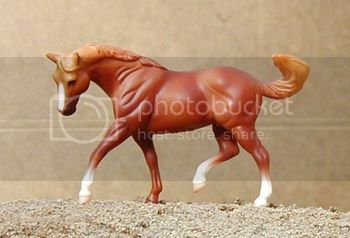 Model information: Safari Ltd. Quarter Horse (about the same scale as Breyer's Littlebits/Paddock Pals), current model. Lines to Bar U Champ Binder, Three Bars[TB], Hollywood Gold, Rugged Lark, Easy Jet, Skipper W.
Model information: Breyer Traditional "Adios" mold, show special produced July-December of 2002; "Brandywine." Lines to Skipper W, Three Bars[TB], Bold Ruler[TB], Two Eyed Jack, Go Man Go. Lines to Zippo Pine Bar, Easy Jet. 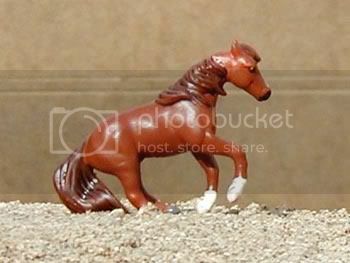 Model information: Breyer Classic scale "Scamper" mold; #750013 Flicka and Yankee Classics Set, produced 2005-2006. Lines to Docs Sug. 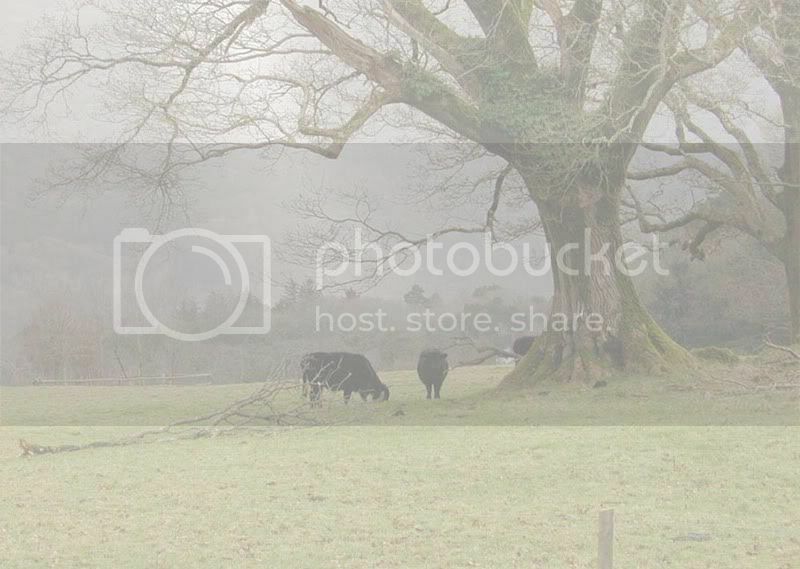 Sire has multiple photo show placings. Model information: Breyer Stablemate scale G2 Stock Horse mold; in set #5201 Western Rider & Saddle Set from 2000-2004, #5985 Buckboard Wagon Set from 2003-2005, and #5316 Buffalo Bill Rough Rider Play Set from 2005-2006. 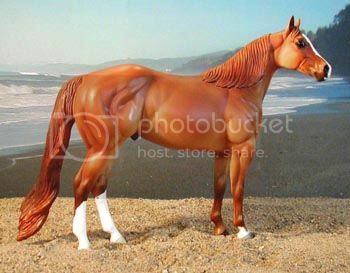 Lines to Mr San Peppy, Easy Jet, Skipper W.
Model information: Breyer Stablemate scale G1 Quarter Horse Stallion mold; Set of 12 Miniatures set, special run through the JCPenney holiday catalog in 1995. Lines to Zippo Pine Bar, Two Eyed Jack, Go Man Go. Lines to Smart Little Lena, Doc Bar, Poco Lena, Peppy San, Leo, Gold Bailey Boy, Bold Ruler[TB], Two Eyed Jack. 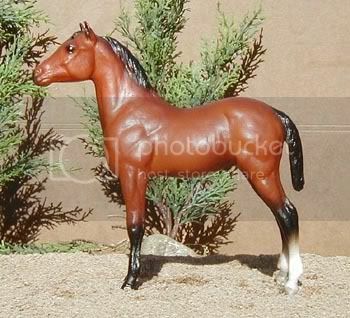 Model information: Hartland 7inch series Quarter Horse Family Stallion; produced 1962-1964. Lines to Smart Chic Olena, Smart Little Lena, Doc Olena, Docs Benito Bar, Doc Bar. 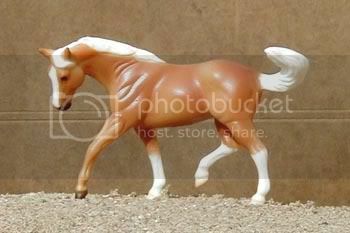 Model information: Breyer Classic scale Cutting Horse mold, portrait of the real "Smart Little Lena;" 2004 Limited Edition, 10,000 made. 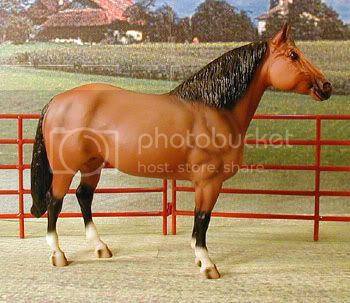 Lines to Zips Chocolate Chip, Zippo Pine Bar, Easy Jet, Skipper W.
Model information: Breyer Traditional Stock Horse Stallion mold; special run "Kiwi" in 2000; 5,000 made. 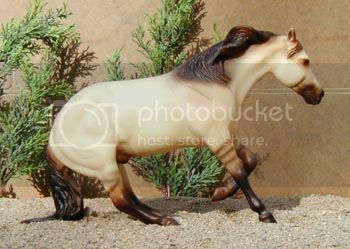 Lines to Don Wrede, Peppy San Badger, Easy Jet, Skipper W.
Model information: Breyer Traditional scale Ranch Horse mold; "Cody" The Ranch Horse, produced 1999-2000. Lines to Hollywood Gold, Roan Hancock, Scotch Bar Time, Sonny Dee Bar, Chubby Time. 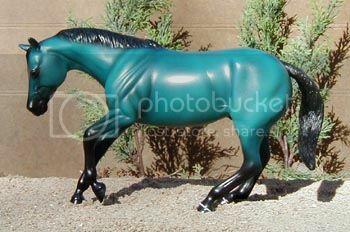 Model information: Breyer Stablemate scale G1 Quarter Horse Stallion mold; #10103 Seabiscuit Stablemates Collection, produced 2003-2004. Lines to Easy Jet, Go Man Go, Hollywood Jac 86, Hollywood Gold, Grey Badger II, Jackie Bee. Lines to Zippo Pine Bar, Three Bars[TB], Poco Bueno, Easy Jet, Skipper W.
Model information: Breyer Traditional scale portrait of the real "Zippo Pine Bar," produced 1999-2006. 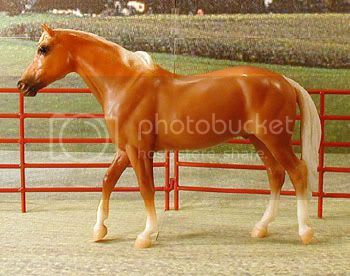 Sire is an AQHA World Champion, NRHA Futurity Open Champion, NRHA Hall of Fame inductee, has a ROM in Reining, and is a leading sire. Lines to Bar H Leo, Cutter Bill. 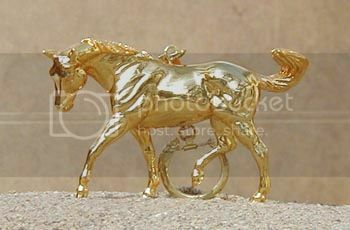 Model information: Creata Winner's Choice Micro Mini Sliding Horse mold; from the Series 1 American Quarter Horse set. 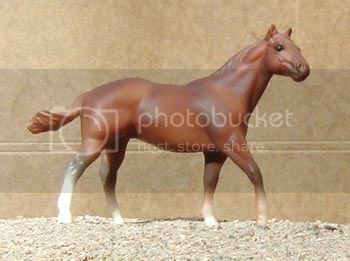 Model information: Breyer Classic scale American Quarter Horse Stallion mold; #750602 AQHA Poco Bueno Family, special run sold through Wal-Mart in 2007-2008. Lines to Rugged Lark, Easy Jet, Skipper W., Impressive. 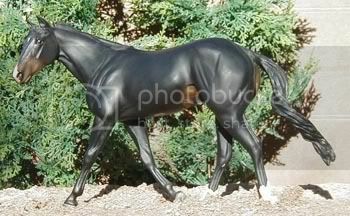 Model information: Breyer Traditional Ranch Horse mold; portrait of the real "Easy Jet," special run for Quarter Horse Outfitters in 2001. Lines to Don Wrede, Two Eyed Jack, Sugar Bars, Three Bars[TB]. 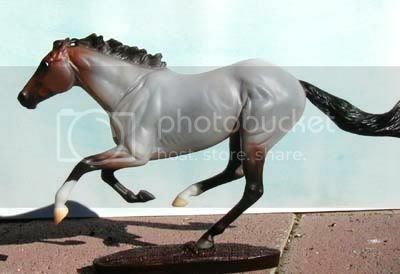 Model information: Breyer Traditional scale "Adios" mold; produced 1997, version with "bi-colored eyes" produced first few months only. 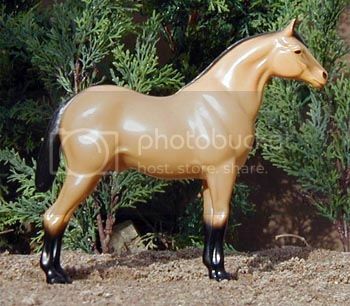 Model information: Breyer Classic scale "Scamper" mold; #477 "Scamper," Barrel Racer, produced 1998-current. Lines to Poco Bueno, Three Bars[TB], Impressive. 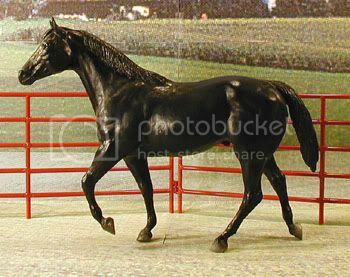 Model information: Stablemate G1 Quarter Horse Stallion mold from the Stablemates Little Red Stable set produced 1998-1999. Lines to Skipper W., Peppy San Badger, Gray Badger II, Easy Jet. 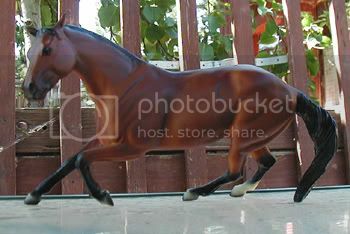 Model information: Breyer Stablemate scale G2 Stock Horse; from the Stablemates Horses Gift Pack, produced 2002-2006. 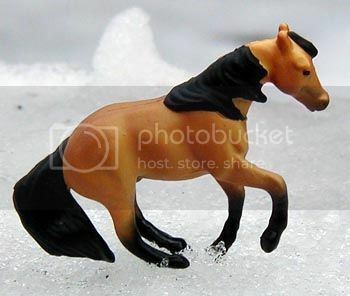 Model information: Breyer Micro Mini Loping Stock Horse mold; #300107 Australian Outback Adventure Play Set, produced 2005-2006. 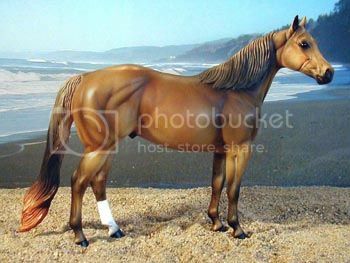 Lines to Rugged Lark, Easy Jet, Skipper W.
Model information: Breyer Stablemate G1 Quarter Horse Stallion special run from Sears in the 12-Piece Stablemates Gift Set, 1998. Lines to Rukin String, Doc Bar, Poco Tivio, Poco Bueno, Feature Bonanza. 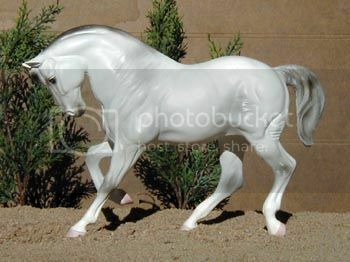 Model information: Stone Horses Performance Horse mold; Turquois Performance Horse, part of the Precious Stone series. Lines to Mr Gun Smoke, Leo, Doc Bar, Poco Bueno, Joe Reed. 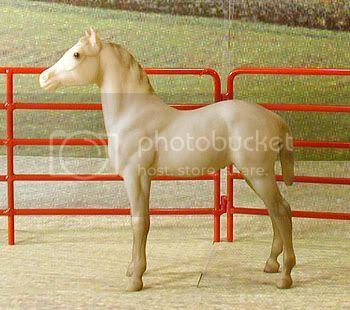 Model information: Breyer Traditional scale Standing Stock Horse Foal mold, #228 Bay Quarter Horse Stock Foal, produced 1983-1988. 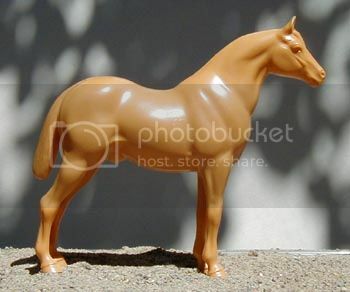 Lines to Mr San Peppy, Leo San, Leo, Easy Jet, Skipper W.
Model information: Hartland 7" Quarter Horse Stallion mold, an unpainted "budget" model from 1966-1969. Lines to Rukin String(r), Barlet, Doc Bar, Poco Tivio. 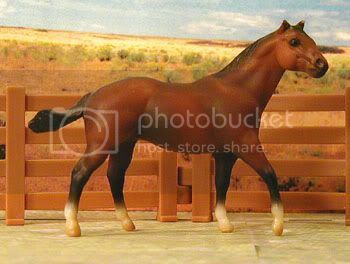 Model information: Breyer Classic scale "Wahoo King" mold, #6002 Roping Horse and Calf set produced 2000 and #6014 Calf Roper set produced 2000-2004. 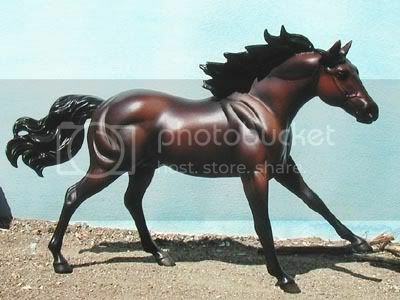 Model information: Breyer Classic scale Cutting Horse mold, Cutting Horse and Calf set, produced 1997-1999. Lines to Jet Deck, Barlet, Doc Bar, Poco Tivio, Poco Bueno, Joe Reed. Model information: Breyer Traditional "Adios" mold, Dale Evans' "Buttermilk;" produced 2000-2003. Lines to Rukin String, Doc Bar, Poco Bueno, Joe Reed. 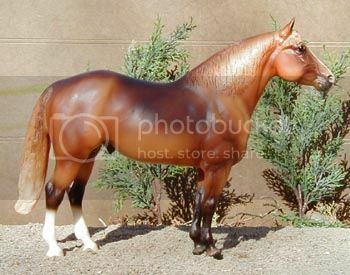 Model information: Breyer Traditional "Adios" mold, "Mesa" The Quarter Horse" produced 1991-1992. Lines to Skipper W., Barlet, Doc Bar, Poco Tivio, Poco Bueno, Joe Reed. 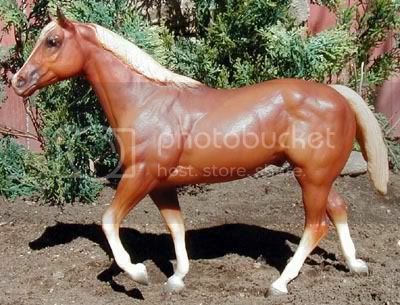 Model information: Breyer "Mini Whinny" scale Sliding Horse(?) 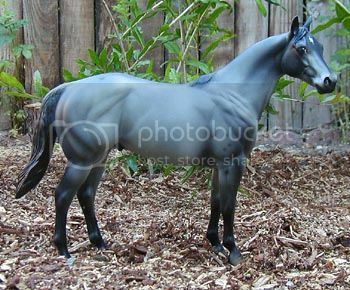 mold; from the Mini Whinny Stallions set; produced 2005-2006.